IRAN VOWS TO CONTINUE BACKING PALI TERRORISM……. – The Tundra Tabloids……. IRAN VOWS TO CONTINUE BACKING PALI TERRORISM……. A terrorist regime doing what a terrorist regime is expected to do, supporting terrorists. NOTE: Anyone in the West supporting dialogue with Hamas, is by default, in bed with the genocide-of-the-Jews promoting Iranian regime. 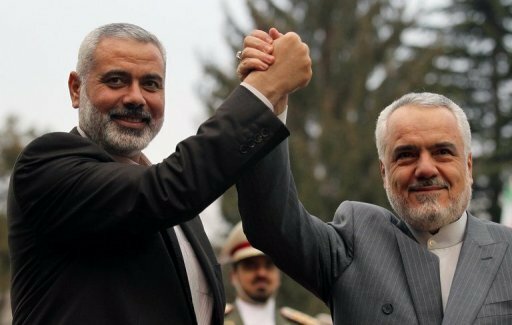 Iran’s first vice president tells Hamas prime minister Haniyeh that Palestinian issue is a “red line,” adding that Israel will soon “be punished” for “plots, aggression,” AFP reports. Iran pledged Friday to back Palestinian resistance against Israel, saying “soon the Zionist regime will be punished for its plots and aggression,” AFP reported Iran’s first vice-president Mohammad Reza Rahimi as saying. Rahimi made the remarks to visiting Hamas Prime Minister Ismail Haniyeh, who arrived Friday for three-day trip. Previous Post Previous Post ANCLAM CHOWDER STARTS ANTI-HINDI PARTY IN INDIA……. Next Post Next Post 28 BLOWN UP IN TERRORIST ATTACK IN ALEPPO SYRIA…….